Last month, I was invited to travel to Dubai to report on the 2018 World Government Summit, where the globe’s most innovative and entrepreneurial thinkers gather each year. The brightest minds of our day spoke about the government’s’ role in endeavors such as space travel, AI, robotics, as well as something more surprising: happiness. 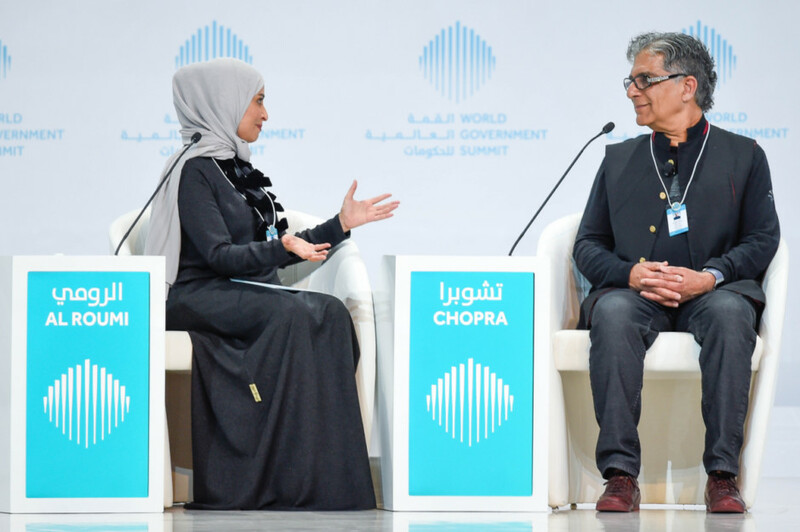 Dubai – home to the first-ever Ministry of Happiness – was the perfect place to discuss how governments can do more to invest in their citizens’ emotional, physical, mental, and social health. 1. Flexible Workplaces: What we do gives us purpose – and happiness – in life. As Jan-Emmanuel de Neve of Oxford said at WGS, “Work provides a purpose, establishes social relationships, structure, and routine in our daily lives.” Investments in improving working conditions produce huge returns for businesses, in terms of increasing productivity and profitability, and for individuals’ happiness. Simple changes like increasing workplace flexibility and boosting access to paid leave lead to performance improvements and increases in worker satisfaction, in addition to significantly lower turnover. 2. Mental Health: Developed countries are confronting a serious mental health crisis that is devastating communities and hurting the global economy, with just a quarter of people with mental health challenges in developed nations receiving treatment. Fortunately, investments in mental health can be extremely effective – and cost-effective. The 2018 Global Happiness Policy Report finds that every dollar spent on mental health prevention and treatment leads to an extra 2.5 dollars of GDP, by bringing more people into the workforce and increasing productivity. Digital and telehealth services could improve cost-effectiveness by up to 5-fold and would cost just 0.1 percent of global GDP. 3. Social Inclusion: Happier societies tend to be those in which all share in the benefits of economic development, social capital, education, and political power. While ethnically similar countries like the Scandinavian nations have an advantage, governments around the world can (and must) do more to ensure specific socioeconomic, ethnic, or religious groups are not left behind. Universal access to public services including health and education and equal treatment under the law is absolutely essential, but are not sufficient in themselves. Governments need to get creative to ensure all are brought into the fold and are satisfied and fulfilled. 5. Climate Crisis: The growing climate crisis is making it harder for governments to keep their people happy. Land degradation, growing pollution, and the increasing frequency and severity of natural disasters such as droughts, heat waves, and floods are sapping people’s happiness, and in some cases, even forcing them from their homes. Governments need to do more to ameliorate the impacts of climate change. Over the short term, that means better storm and disaster infrastructure and more access to insurance and programs to help families relocate if needed. Over the long term, action is needed to slow the pace of climate change. 6. 21st Century Skills: The modern economy requires new skills for workers to thrive. The digital revolution has sadly left millions of workers behind, as their skills, jobs, and even entire industries have been eliminated or automated. Governments need to find new ways to ensure the livelihoods and dignity of these workers. Around the world, policymakers are exploring options ranging from skills retraining programs to a universal basic income. 7. Income Inequality: High-income capitalist countries face the unique problem of inequality. Studies show that the absolute level of one’s wealth tends to matter less to their happiness than their economic status relative to others. People in low- or middle-income countries with greater economic equality tend to be happier, therefore, than those with the same incomes in more unequal societies. Access to high-quality public services (health care, child care, and education, for example) help reduce the cost of living, while a living minimum wage can ensure a greater degree of economic justice. 8. Physical Health: Physical health problems place a major weight on the economy, because of non-employments, absenteeism, and increased health care costs. It also is one of the greatest sources of citizens’ unhappiness, particularly in high-income countries, according to surveys. Spending more on preventative health is lowest-hanging fruit, in terms of making people happier while also boosting the economy and lowering costs. 9. Busting Corruption: Corruption kills social trust and happiness. Lack of trust in one’s community and in government are devastating for personal happiness – when one feels as if they cannot fairly compete in the economy or in the political system, resignation and defeat sets in. Corruption not only erodes social trust and happiness, it leads to poorer provision of services that lead to further dissatisfaction. Quality of government is also strongly associated with longevity and positive health measures. Stronger anti-corruption laws, investigative authorities, greater transparency all go far to improving trust and happiness. 10. Happy Families: Happiness is vitally shaped by the quality of our marriages and parenting. In fact, people with high wellbeing spend on average 1.5 times as many hours with family than the global average. Family is key to our mental health and sense of worth. Changes in the workplace, like flexible hours and family leave provisions, can go far in improving family-work balance, and in providing a support system for parents to raise healthy, positive, and happy children.